Today Cowen and Company upgraded FedEx (FDX Charts & Current Quote) to "Outperform." Cowen raised their target for FDX to $210 from their prior target of $155. Today is FedEx's Annual Shareholders Meeting which began at 8AM, CST. You can view a webcast of the meeting here. A Briefing.com report on Schwab's site says Cowen expects FedEx to "announce a new share purchase program and potentially increase the dividend at today's annual meeting." Analysts at Wolfe Research upgraded shares of FedEx from a “market perform” rating to an “outperform” rating in a research note on Thursday, September 18th. Separately, analysts at Macquarie reiterated an “outperform” rating on shares of FedEx in a research note on Thursday, September 18th. They now have a $184.00 price target on the stock, up previously from $160.00. Finally, analysts at Deutsche Bank reiterated a “buy” rating on shares of FedEx in a research note on Thursday, September 18th. They now have a $179.00 price target on the stock, up previously from $178.00. Seven investment analysts have rated the stock with a hold rating, eleven have assigned a buy rating and two have given a strong buy rating to the stock. The stock presently has a consensus rating of “Buy” and a consensus price target of $159.33. Currently, FDX is trading at $162. $210 is 30% or $48 higher. Disclosure: I am long FDX. Also, FDX was one of the core stocks that I started my newsletter Explore Portfolio with on September 1998 when it was only $22.50. My belief back then that continues today is FedEx will benefit greatly from people and businesses ordering goods on the internet. 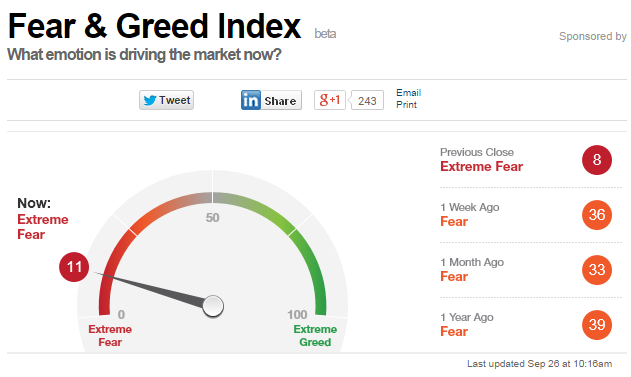 Fear and Greed now down to 11! Wow! We got here fast! The median single-family home price for Los Altos California as of August 2014 is $2,250,000 a gain of 2% over August 2013 when it was $2,204,000. 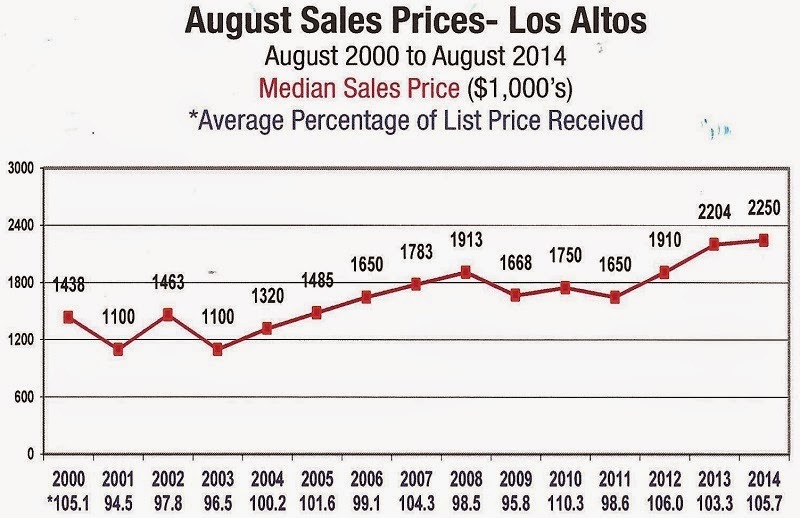 The average Los Altos home sold for 5.7% above the asking price! 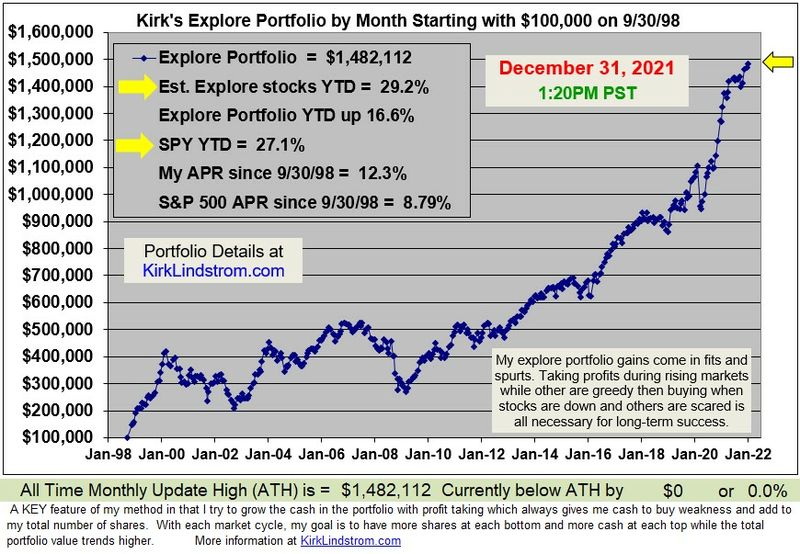 The three portfolios in Kirk Lindstrom's Investment Letter are again near record all time highs. Subscribe today and get the September 2014 Issue for FREE! 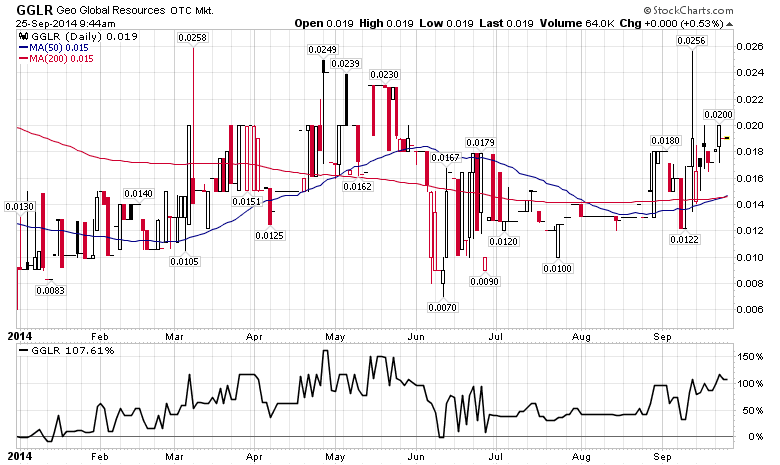 GeoGlobal Resources Inc. or GGLR (GGLR charts and quote) is back in play. The old website is back on after the new website went live earlier this month. 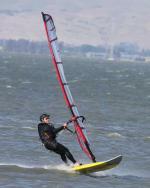 Jean Paul Roy is back in a leadership role! President/CEO: Jean Paul Roy has in excess of thirty years of geological and geophysical experience in oil & gas basins worldwide as he has worked on projects throughout India, North and South America, Europe, the Middle East, the former Soviet Union and South East Asia. His specialties include modern seismic data acquisition and processing techniques, and integrated geological and geophysical data interpretation. Since 1981 he has held geophysical positions with Niko Resources Ltd., Gujarat State Petroleum Corporation, Reliance Industries, Cubacan Exploration Inc., PetroCanada, GEDCO, Eurocan USA and British Petroleum. 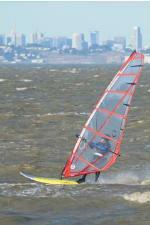 Mr. Roy graduated from St. Mary’s University of Halifax, Nova Scotia in 1982 with a B.Sc. in Geology and has been certified as a Professional Geophysicist. Watch for future press releases here. Disclosure: In June of this year, 2014, I added 10,000 shares of GGLR at $0.0081 to my ROTH IRA. On December 31, 2013, as a year-end tax loss selling play, I added 10,000 shares of GGLR to my regular trading IRA at $0.0094. Those two buys significantly increased my holdings of this penny stock. I've personally made a lot of money with over the years buying when dirt cheap then watching what the insiders do to get an idea when to take big profits out. I also cover GGLR in my newsletter where the shares I hold are well into "house money" from selling the ups and down.